The digital currency that has swept across the globe in the last few years cannot be ignored any longer. 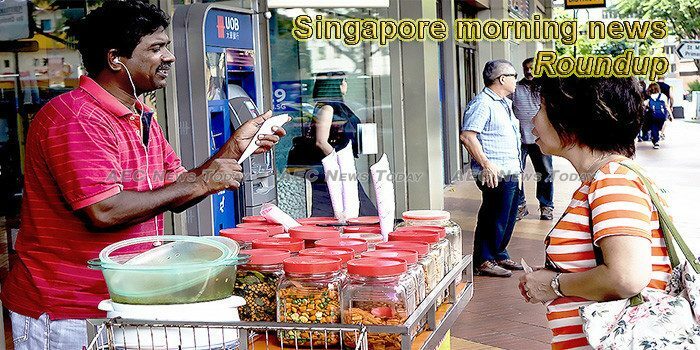 The recent success of Singapore’s “Token Day” to mark the 10-year anniversary of cryptocurrency, showed the potential for crypto adoption in across the island-nation. A social enterprise model for some of Singapore’s hawker centers has been criticized over high costs and poor management, as the wealthy nation tries to revitalize its popular food stalls. Over half of the 600-over Singapore online businesses surveyed said they expanded overseas within their first year. Singapore has the right ingredients to make it the urban agriculture and aquaculture technology hub in the region, Dr Koh Poh Koon, Senior Minister of State for Trade and Industry, said on Tuesday (Jan 15). Singapore had to overhaul its rules and systems for the hiring of foreign domestic workers to put a stop to forced labour in the wealthy city-state, campaigners said on Tuesday. PSA INTERNATIONAL handled 81 million twenty-foot equivalent units (TEUs) of containers at its port projects around the world for the year ending Dec 31, 2018, up 7 per cent from a year ago. WITH hiring demand in the tech sector catching up with demand from the finance industry, Singapore appears well on track to add “tech hub” to its financial-centre status, says a report published by Glassdoor. Importers of key food items may be required to come up with preventive strategies and other plans to mitigate the impact of supply disruptions to Singapore, which imports more than 90 per cent of its food and is vulnerable to factors affecting global supply, such as disease outbreaks and climate change. Changes to the Misuse of Drugs Act that put greater focus on rehabilitation and shift a little away from the philosophy of long-term detentions were passed in Parliament on Tuesday (Jan 15). The Premier League’s first international office opened in Singapore on Monday (Jan 14) as the football body looks to ramp up its fight against piracy. Singapore-based investors and developers have over the years gained a firm foothold in India’s property market and are now venturing beyond commercial offices to bet on emerging sectors such as logistics, warehousing and urbanization projects. Youth in Singapore who get the news from social media platforms are less informed of current affairs, a recent survey by Singapore Polytechnic students has shown. A Singapore agency run by the country’s former Cabinet Secretary is giving start-up businesses free training in digital business solutions, in a bid to improve their growth and resilience. Digital insurance firm Singapore Life has started 2019 with a bang after it raised $33 million across two investments as it eyes new market expansions in Southeast Asia. Fortune Real Estate Investment Trust (SGX: F25U) and Cromwell European Real Estate Investment Trust (SGX: CNNU) will be providing important updates in its next earnings release. Here’s what investors should be looking out for. The Cyber Security Agency of Singapore has accelerated the implementation of the Cybersecurity Act, with all critical information infrastructures (CIIs) designated by end 2018. Sales of marine fuels in Singapore, the world’s biggest ship fuelling port by volume, totalled 49.8 million tonnes in 2018, down 2 percent from a record the year before, the Maritime and Port Authority of Singapore (MPA) said on Monday. Here’s why Singapore Exchange Limited (SGX: S68) is a great starter stock. The Singapore National Eye Centre (SNEC) will reduce charges for certain complex procedures with higher fees from March this year, following a review requested by the Ministry of Health (MOH). Is Keppel Corporation Limited A Bargain Now? Three ratios appear to indicate that Keppel Corp could be a bargain? Methanol a dark horse in ‘alternative fuel’ race? IT IS almost inconceivable anybody in the shipping industry is still unaware that the International Maritime Organization’s (IMO) global 0.50 per cent sulphur-in-fuel cap comes into force in less than a year. Chinese bicycle-sharing operator ofo has breached multiple regulatory requirements and, yesterday, the Land Transport Authority (LTA) gave it a Feb 13 deadline to comply with them. Singapore’s export-driven economy is among the most vulnerable in the ongoing U.S.-China trade conflict, but major investors said its stock market could deliver attractive returns this year. The Health Ministry will tweak healthcare financing to ensure it remains affordable for subsidised patients. This includes more frequent, three-yearly reviews on MediShield Life caps so they reflect healthcare inflation. It will also keep a close watch on public healthcare costs. The Goh Chok Tong (GCT) Enable Awards was launched on Tuesday (Jan 15) to recognise the achievements and potential of people with disabilities. What do four separate financial ratios tell us about Singapore Airlines? It will not be able to commence by end 2024. Registration for Ministry of Education (MOE) Kindergartens or MK is set to become an online exercise, the ministry announced in a press release on Tuesday (Jan 15).